Death in Blackpool is rather brilliant. OK, it isn't the most cheery of Christmas tales but it is genuinely rather moving. It's got that Eastender's Christmas Special vibe about it: Christmas is when all those horrible family secrets leak out with unintended consequences. The final scene between the Doctor and Lucie in particular is rather wonderful both in the writing - applause to Alan Barnes for that - and the performances. Sheridan Smith's Lucie Miller is - as usual - belligerently brilliant. Lucie Miller is one of those companions that I'd love to have seen in the television series. I think she'd fit right into New Who. And, after Night of the Doctor, she's canon. As if that matters. It seems though that this is the end of the Doctor's travels with Lucie. The reason for this is that the truth is out about Aunty Pat. The truth that Aunty Pat is actually a Zygon Warlord called Hagoth - a story told in The Zygon Who Fell To Earth - and that the Doctor and Aunty Pat/Hagoth have been keeping it from her for all this time. It pops Lucie's bubble of trust in the Doctor and so she decides to stay on Earth and leave the Doctor. It's all spelled out in that last scene, which I might harp on again about for a bit. It's a lovely two hander between Sheridan Smith and Paul McGann. There's a bit of it when The Doctor tries to explain that he isn't a superhero which is amongst the best writing I've seen in any Big Finish Doctor Who story. In fact that whole last scene is one of my favourite bits of Big Finish ever. I even got a wee bit tearful, which is a little embarrassing when you're on public transport but I can cope. 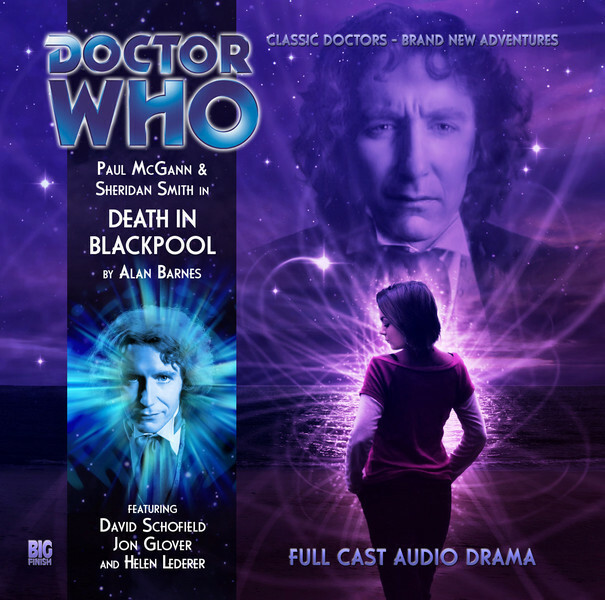 Paul McGann's up to his usual high standards. It makes you bang your head against the table in frustration that he never got a proper television run. He's an excellent actor and his Doctor has so much depth. The fact that he seems to work exceptionally well with Sheridan Smith helps to. The Eighth Doctor and Lucie Miller are one of my favourite Doctor-Companion relationships in all of Doctor Who, which is saying a lot. They're up there with The Fourth Doctor and Romana II and the Seventh Doctor and Ace for me. The other great performance here is Helen Lederer as Aunty Pat. I know Helen Lederer as a comedian more than an actress but she's a revelation here. She handles the dramatic stuff with aplomb and there's a lovely series of conversations in a cupboard with the Doctor which are well-worth a listen. Oh and a nod to for Jon Glover as a rather down-at-heel Brummie Father Christmas. However perhaps the greatest credit should go to Alan Barnes for the script. It manages to tell a good Doctor Who adventure whilst slotting in additional layers about trust, love and loss. And almost right at the end he manages to get in the possibility of a little redemption for one of the characters.